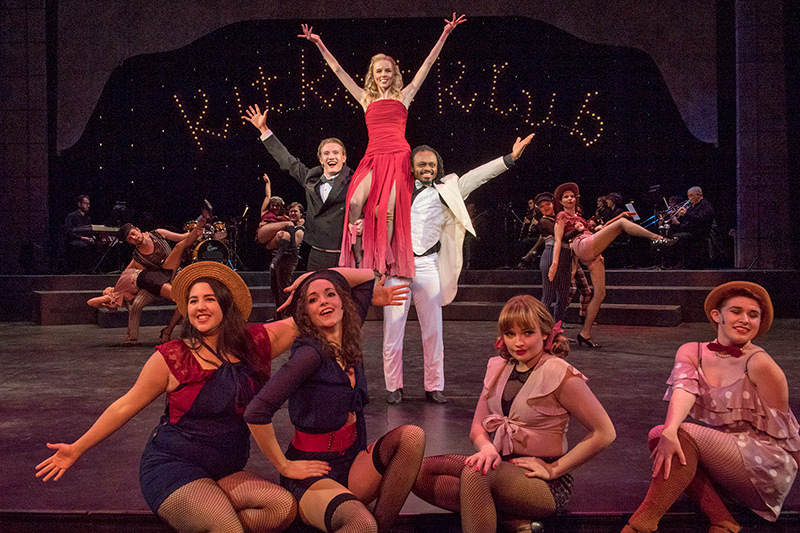 Deaf and hearing actors and dancers from RIT/NTID Performing Arts and RIT’s College of Liberal Arts performed Cabaret in American Sign Language and spoken English during the 2018 theatrical season. Mystery, murder, dance, a look at deaf life, and the struggle to survive Nazi Germany are all part of a new collaborative season by Rochester Institute of Technology’s National Technical Institute for the Deaf Performing Arts program and College of Liberal Arts Theater Arts program. I and You, written by Lauren Gunderson and directed by Andy Head, Oct. 25-27, 1510 Lab Theatre, Lyndon Baines Johnson Hall. Two students are brought together through a mundane poetry project involving Walt Whitman’s Leaves of Grass. As the two let down their guards and share their secrets, the project unlocks a much deeper mystery. People of the Third Eye, directed by Patti Durr and Karen Christie, Nov. 15-17, Panara Theatre. This unique work showcases slices of deaf lives, both contemporary and historical. Collaboratively created by the cast members, the show features various genres of American Sign Language performance including poetry, narrative personal experiences, creative storytelling, reenactments of historical events, as well as dramatic monologues and dialogues. Text M for Murder, written by Frederick Knott and directed by Luane Davis-Haggerty, Feb. 28-March 1, 2020, in 1510 Lab Theatre. Tony Wendice thinks he has arranged the perfect murder. Unfortunately, the murderer gets murdered and the intended victim survives. Through a series of unlucky twists and turns, and with the help of a secret lover and an inspector from Scotland Yard, the truth is uncovered, a trap is set, and Tony admits his guilt. Bent, written by Martin Sherman and directed by Matthew Nicosia, March 27-29, 2020, in Booth Black Box theater. In 1934 Berlin on the eve of the Nazi incursion, Max and his lover Rudy are recovering from a night of debauchery with a German stormtrooper. Two soldiers burst into their apartment beginning a nightmare odyssey through Nazi Germany. Eventually taken to a death camp at Dachau, Max is branded with the “pink triangle,” a mark of persecution and discrimination the Nazis used to identify homosexuals, but clings to his hope for survival. Dance: The Rhythm of Motion and Light, conceived and directed by Thomas Warfield, April 17-19, 2020, in Panara Theatre. This multi-arts, multi-experiential dance performance uses innovative collaborations with technology, such as augmented reality, and live music. The choreography is created from the technology itself, and the show promises to be a spectacle of color, light, movement and music. All five productions are planned to be fully accessible for deaf, hard-of-hearing and hearing audiences, whether using captions, American Sign Language in the performance, interpreters or a combination. Bent is not appropriate for children under 12.